Lived AD 23 – 79. Pliny the Elder wrote the world’s first encyclopedia. His Natural History contained over a million words in 37 volumes. Pliny attempted to document all known facts about the natural world. He claimed to have recorded 20,000 pieces of information, although modern scholars say he underestimated his own output. Remarkably, Natural History survives intact and can still be read today almost 2,000 years after it was first compiled. As commander of a Roman naval fleet, Pliny sailed into the neighborhood of Vesuvius’s eruption in AD 79. His purpose was to rescue people and to make a scientific record of the phenomenon. He famously died in the aftermath of the inferno that destroyed the Roman cities of Pompeii and Herculaneum. Pliny the Elder was born in late AD 23, or possibly early AD 24, in the town of Novum Comum in the Roman Empire’s province of Transpadane Gaul. His birthplace is now called Como; it sits in northern Italy, about a mile from the Swiss border. His true name was Gaius Plinius Secundus. Pliny was born into a wealthy family placed in the second rank of the Roman Empire’s aristocracy – the equestrian order; this roughly translates into English as knights. In practice, the equestrians were the Empire’s municipal governing class, and members were expected to perform military service. They were counted upon to behave heroically to show the lower ranks that equestrians were worthy of their privileged status. During his teenage years, Pliny was sent to Rome to be educated. He was educated well, but these were rather frightening times – Rome’s paranoid emperor Caligula was imposing a reign of terror and death on real and imagined dissenters. A determined man, Pliny took his obligations seriously. At age 24 he began military service in Germany, where he completed three tours of duty in about 10 years as a cavalry commander. Pliny became well-known for his excellence as an army officer. He was a good friend of another equestrian officer, Vespasian, who would eventually become Rome’s emperor. Pliny’s interest in literature and grammar grew while he was in the army, and he began writing. His first book: De jaculatione equestri was about utilization of javelins by cavalry. Later he wrote a 20-volume book: Wars in Germany. Pliny moved to Rome in about AD 59, age 36. The infamous Nero had been emperor for five years, and Pliny seems to have lain low as a survival technique. He later described Nero as ‘an enemy of the human race.’ Pliny worked as a lawyer in Rome. To steer clear of Nero, he may have returned to military service for some time until AD 68, when Nero died. When Vespasian became emperor in AD 69, his old comrade in arms Pliny became one of his most trusted advisors. Pliny served as governor of a succession of Rome’s imperial provinces, (probably) serving in southern France, northern Africa, Spain, and Belgium. He also spent time in Rome, advising Vespasian and Vespasian’s son Titus, who was sharing his father’s duties as emperor. Pliny would have been familiar with the Pont du Gard in southern France. The aqueduct was completed a few years before he became governor of the region. The Romans were masterful builders. Image by Benh Lieu Song. In AD 77, Pliny published his famous 37-volume work Naturalis Historia or Natural History. Unusually, the entire remarkable work – it contains over a million words – has survived intact – it is one of the most substantial ancient works available to modern readers. Pliny had worked on Naturalis Historia for many years, with two assistants. One assistant would read aloud works by great authors such as Aristotle, Hipparchus, and Eratosthenes. Pliny would extract relevant facts from what he heard and dictate them to his second assistant for inclusion in his book. 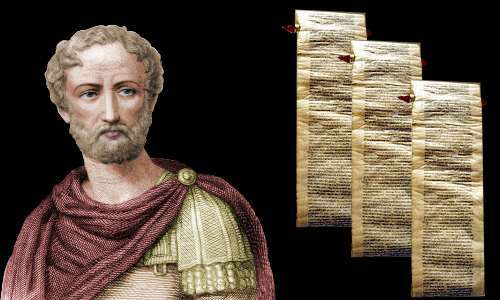 He cited twice as many Greek authors as Roman authors, which was honest, but probably vexing for him, because Romans liked to believe their civilization was superior in every way to the earlier Greek civilization. Romans usually portrayed the Greeks as untruthful, unscrupulous, and gullible. Pliny was a very busy man indeed, with a life full of imperial duties. He worked on his encyclopedia in his spare time, such as when he was eating or traveling. He carried out his official duties by day and worked as an author while others slept. He seems to have needed remarkably little sleep – just a few hours a night. He regarded sleep as a waste of time, and above all else he hated wasting time. Pliny did not write his book for financial gain. In Pliny’s time, and for more than a millennium subsequently, all copies of books had to be copied laboriously by hand, because the printing press had not been invented. Moreover, there were no copyright laws. A few copies of the book would have been commissioned by Pliny with financial help, perhaps, from the emperor. After this, anyone who wanted a duplicate of Natural History would get scribes to laboriously copy out its million plus words. Modern scholars put the number of pieces of information at 37,000. As we shall see, the information Pliny provides is a mixture of the scholarly and the fanciful. Pliny expresses disdain for his contemporaries, whom he accuses of copying word for word great works from the past without acknowledging their sources. By way of contrast, Pliny shares the names of his sources with us. He says this is out of respect for these scholars and to let us know where to check his facts. Natural History was a new style of book. It does not tell a story, or deal with only one field, or try to promote a particular theory. It is simply a collection of diverse facts. Pliny provides us with a detailed list of topics. He does not expect us to read his work from beginning to end. He has written a book for us to dip into when we need information quickly. Today we describe such as work as an encyclopedia. Pliny’s was the world’s first. Natural History covers astronomy, anthropology, geography, botany, horticulture, farming, zoology, medicine, chemistry, minerology, and art. The book is a mixture of impressive scholarship, woeful misunderstandings of Greek science, and attention grabbing sensationalism. Natural History offers us a fascinating insight into social conditions and common beliefs in the Roman Empire 2,000 years ago. Pliny correctly tells us that only the Sun and Moon are brighter than Venus, and that Venus is the only heavenly body besides the Sun and Moon bright enough to cast shadows. He is reliable when he tells us that Venus is never farther than a 46 degree angle from the Sun – today we call this the angle of elongation. Pliny tells us of Eratosthenes’ report that in Trogodytice (Ethiopia) shadows fall in the opposite direction for 90 days each year. Modern readers know that this is a natural consequence of Ethiopia’s location close to the equator. People living close to the equator see the midday sun in the north during northern hemisphere summer and in the south during southern hemisphere summer. Pliny also tells us about day lengths in various locations. He reports that the longest day in Alexandria is 14 hours (modern value 14h 11m), in Italy 15 hours (modern value for Rome 15h 14m), and in Britain 17 hours (modern value for London 16h 38m). Six days sailing from the north of Britain he says sits the island of Thule, where a day lasts six months, then night lasts six months: this immediately tells modern readers that Thule – whose identity remains a mystery – must lie well within the Arctic Circle. Pliny’s information is largely correct and would have fascinated his readership. The sun at midnight at Altafjord, Norway. Some modern scholars believe Thule was northern Norway. Image by V. Berger. Pliny is correct about the cause of tides, and indeed his information outshines Galileo who, over a thousand years later, claimed the tides were caused by the rotation of our planet. However, Pliny then spoils things a little by claiming that tides in Britain were 80 cubits high (that’s about 120 feet or 35 meters). Generally Pliny does not distinguish between scholarly and sensationalist information. 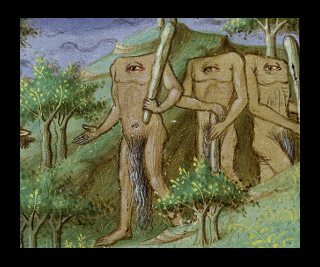 For example, he happily tells his readers about the Blemmyae tribe, who “are said to have no heads, their mouths and eyes being seated in their breasts,” and another African tribe, the Aegipani, who are half-man, half-beast. A picture of the Blemmyae from about 1420. Turning to consider the properties of human and animal bodies, Pliny begins with a statement which, on average, is true; his entry then descends into farce. In fact, what Pliny called ‘veins’ are the optic nerve for sight and the oculomotor nerve for eye movement. These nerves had been described accurately by the Greek anatomist Herophilos 300 years before Pliny’s time. It’s possible that long before Pliny’s time, Greek sailors boiled seawater in vessels whose necks were plugged with fleeces to condense steam and so produce fresh water. A wag once described Natural History as a catalog of ancient error. Scientifically speaking, it’s hard to disagree with this characterization. Although there is good science in it, there is also plenty of bad science and myth. Only someone well-educated to begin with could tell the good from the bad. Pliny’s passion for organizing facts combined with his relentless work ethic gave the world its first encyclopedia. For the brilliance of his concept, and for the scope and ambition of his work, Pliny’s name will always be revered. Natural History remains an outstanding and plentiful source of information about first century Roman beliefs and Roman technology. Furthermore, its discussion of ancient art is highly prized by art historians. Pliny regarded nature – Mother Nature – as female. He believed the natural world was there to be utilized by humans for our benefit. However, he objected to nature’s bounty being abused. He regarded mining operations as a violation of Nature, and criticized people for wearing gold and silver jewelry. He did not marry and had no children. He left his considerable wealth to his nephew, Pliny the Younger, whose own writings we rely on for much of what we know of Pliny’s life. Pliny’s final role in the Roman Empire was commanding the naval fleet on Italy’s west coast. In AD 79, he sailed into the neighborhood of Vesuvius’s eruption. He intended rescuing people and making a scientific record of the phenomenon. He died the day after the Roman cities of Pompeii and Herculaneum were destroyed. The precise cause of his death is unknown. The fact that sailors around him were not killed suggests his death was probably not a direct result of the volcanic eruption or poisonous gas emissions. Pliny the Elder was 55 years old when he died. "Pliny the Elder." Famous Scientists. famousscientists.org. 23 May. 2017. Web.